♦ Myndabókin Gott kvöld kom út árið 2005 hjá Máli og menningu. Hún hlaut Íslensku myndskreytiverðlaunin 2005 og Barnabókaverðlaun Fræðsluráðs Reykjavíkur sama ár. Bóksalar völdu hana sem bestu barnabók ársins og hún var tilnefnd til Norrænu barnabókaverðlaunanna árið 2006. Leikrit byggt á bókinni var frumsýnt í Kúlunni, barnaleiksviði Þjóðleikhússins árið 2007. Leiksýningin Gott kvöld hlaut Grímuna – Íslensku leiklistarverðlaunin 2008 sem barnaleiksýning ársins og fyrir verkið hlaut leikritshöfundur tilnefningu til Norrænu leikskáldaverðlaunanna 2010. Nánar um leikritið hér. 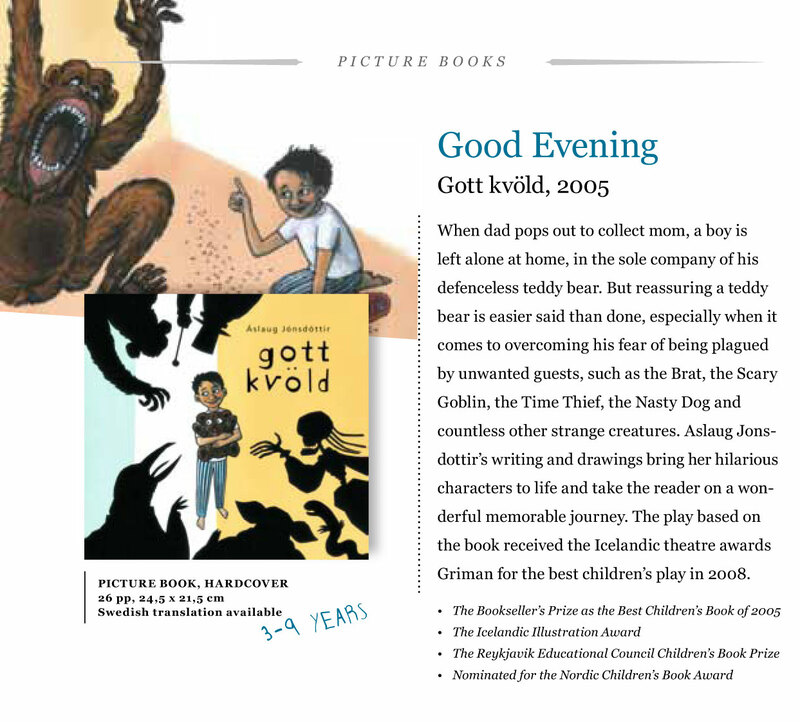 ♦ The picture book Good Evening was published in 2005 by Mál og menning, Forlagið. 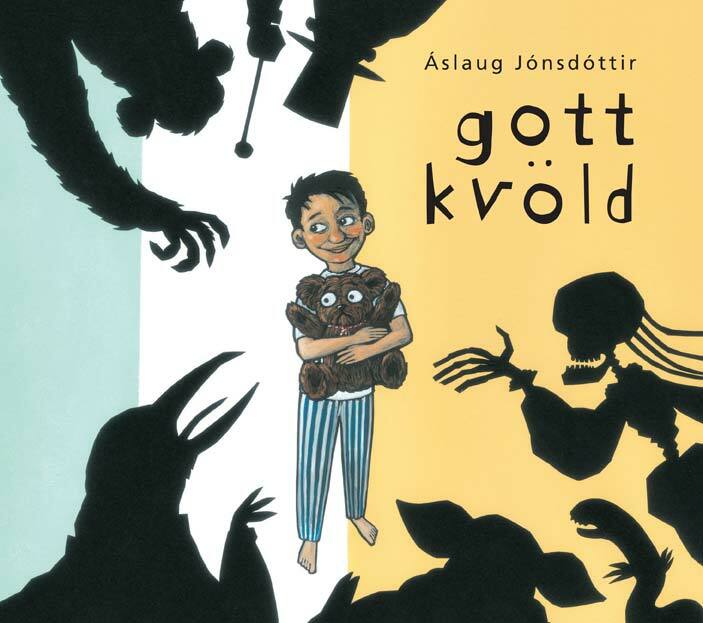 It received several honors: The Icelandic Illustrators Award 2005; The Bookseller’s Prize as the Best Icelandic children’s book 2005; and Reykjavík Children’s Literature Prize 2005 and it was nominated to the Nordic Children’s Book Prize 2006. A play based on the book was premiered in 2007 in The National Theater of Iceland. The production received Gríman 2008 – The Icelandic Theater Award as the best children’s production of the year. Author and script were nominated to The Nordic Drama Award 2010. More about the play here. 2007: leikrit frumsýnt í Kúlunni, Þjóðleikhúsinu. | The National Theater of Iceland, 2007. ★ Gríman – Íslensku leiklistarverðlaunin 2008 – Barnasýning ársins. | ★ Gríman 2008 – The Icelandic Theater Award as the best children’s production of the year. ★ Tilnefning til Norrænu leikskáldaverðlaunanna 2010. | ★ Nomination to The Nordic Drama Award 2010. ♦ Evrópufrímerki 2010, tileinkað barnabókum. Mynd af síðu úr bókinni. Hönnuður: Örn Smári Gíslason. ♦ Europa Stamp 2010. Theme: Children’s books. Picture of a page from the book. Designer: Örn Smári Gíslason.